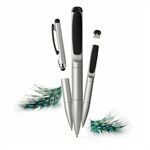 Stylo brings traditional writing and current technology together in one pen. Small notes or a quick sketch can be made with the ballpoint on paper or with the precision touch pen on your phone or tablet. On top of that all your data can be stored on the 2Gb USB stick.